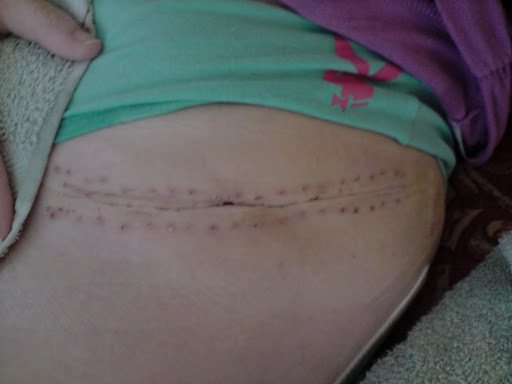 Pelvis scar looking much neater now and is less sore without those staples in. 19 days post op, again recovered after being cleaned today, as i wouldn’t want clothes to rub them just yet! Here is the long leg one from today and it’s 19 days post op, what a difference in 5 days! Still keeping it covered, did a quick clean up and recovered it for now. So you can see the 2 together, the pelvis one is the sore one, as it’s over bone. 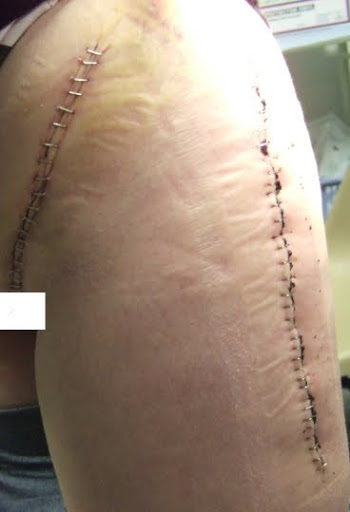 Again this is with staples in at 2 weeks post op. 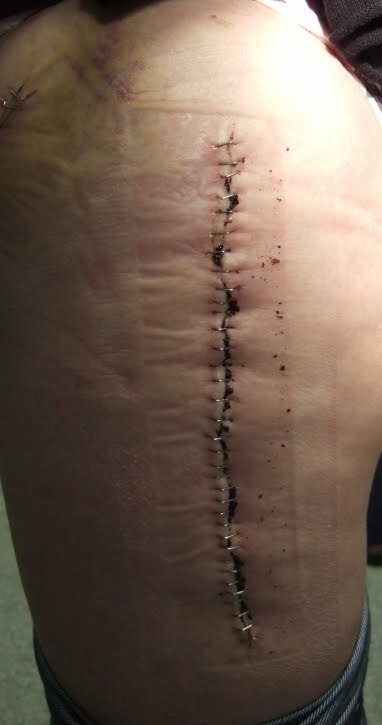 Here is my leg scar around 11-12 inches long with staples in. This was 2 weeks post op. Well the day started manic as ever, as we had to set off at school time 8.40am and get into the Hospital for 10.30am, as the Motorways had been playing up while i was in hospital we didn’t want to take any chances. I was already being very lucky in the fact that i was getting the 2 appointments together seen as we live further away. We got there with some time to spare, which was excellent for us as we are always late for everything! But it meant i could walk on my crutches nice and slowly as this was the furthest i’d ever walked before, and the ground was wet. Met up with the Physio/Hydro guy Declan and was asked endless questions but i understand they have too. They checked the leg length difference too as the Hospital Physio team that first saw me said my leg was too long and told my Consultant O’Hara. Well i’d been pre warned about the difference by O’Hara himself and he assured me that although it looks and feels long (too long he says) the leg will be pulled up once muscles and nerves and tendons are worked and woke up! In fact O’Hara was so disgusted that his opinion was being questioned that in thick black letters scribbled across my notes ( LEG LENGTH PERFECT INSIDE< DO NOT QUESTION AGAIN!!) LOl think he got his knickers in a twist, but i can understand as he didn't want to worry me and have other officials saying it had gone wrong. Did some land Physio first which was good, i really shocked myself with how much movement i already have (way more than i’ve ever had) and it was the same ish as the opposite hip so not too bad. The worse bit was when he asked me to roll onto the scar side, only managed a few seconds before i had to get off again. Being on your side feels so wrong and damn heavy too. The pool was beautifully warm and there was 5 of us at once with just Declan between us. The weirdness of being able to walk properly unaided once the water was chest level really messed with my mind! It really freaked me out and took a while to get used too. Did some steps and had a floatation device fitted to my ankle to lift my knee to my chest, then move leg straight back and outwards to the side. Did half an hour and was nakkerd afterwards. Been resting at home ever since and it’s really nagging like a dull deep ache, but i did expect it to be honest. The only thing thats troubling me is that it has been knocking since i’ve done these exercises, and i haven’t had that sensation since before the surgery. Thankfully there’s no pain with it but it feels strange and i’m a bit scared.Bet i’m really going to feel the pain tomorrow like you do after a workout session. I’ve ran out of most of the heavy duty painkillers so now just on tramadol and para’s every 6 hours, and take some Quinine at night to help with leg cramps. I feel better each day, and i gain a little more confidence too. Only a quick post as i want to rest up and prepare for tomorrow, i’ve got my first Physio/Hydrotherapy session and i want to give it my all. How fast has that gone!? In that time i’ve gained confidence with crutches and moving around. But i do live in a Bungalow so i have it easy. The whole putting your own knickers on has done my head in, but finally after hundreds of attempts i have cracked it, But socks can go to hell. I doubt i’ll be able to do socks for a long time, but i expect that. The pain has been controlled with oxycontin and paracetamol, but last night they ran out. So back on the old Tramadol with some para’s and surprisingly they have been working so far. I feel a deep ache but no sharp pain, nor does it kill like before. So far the right hip pain has gone except for standing for too long, but the pain felt then is simply tired pain, and the lower back ache has gone for now too. So already i’m feeling so positive about this surgery. Last friday i had a dressing change which doesn’t bother me, i don’t really know why i was sent to a nurse when i could of done it myself. But she liked it and it does put your mind at rest when they say it looks good, and neat. She was shocked with how many staples i had in each wound. The hip wound is 11-12 inches and have a staple in per each cm, and the bikini one is 7 inches with staples per cm too. Had to have them removed today (25th Nov) and i was terrifed to be honest. I took the torture medieval device the hospital gave me, and everyone said they would ping out. Not so, the nurse said these were different to the normal ones and it was a good job i brought the device myself as they wouldn’t of had one. She did every other one for me as the sensation made me sick and faint. The pain is a stinging pain so not bad in itself, but the tugging of the wound really knocked me for six. Once i was lying down it was a lot better, but she still only took half out, as she said there was too many for me to handle being took out in one day. (Thank you i needed the break from that sick feeling) So i do have to go back tomorrow for the rest out, but least i know what to expect now and i will lie down first, instead of standing like before. Hopefully i won’t feel so sick or faint then. On Friday 27th Nov i have physio/hydrotherapy so i will let you know how it goes, looking forward too it as well as being bit scared. I know he’ll push me quite hard but he promised he would rehab my right hip also as i explained that, that one has never recovered it’s strength or stamina since that surgery. These days passed very quickly for me, The Monday i was so sick i could barely move, and shaky i really felt like i had flu like symptoms. The nurses think it’s the oramorph but i hadn’t had any that day at all. So literally everytime i went to the loo, i was back into bed sleeping. I did not eat either that day, just the smell alone was enough to make me heave. At the night drug run around 10pm i was given some oramorph (oral morphine) and boy did i pick up then! I was life and soul of the party, gutted they didn’t think of doing this ealier while my Hubby came to see me, as i slept through his whole visit, bless he drove 3 hours there and back for that visit too! Tuesday was going home day Yay!!! So the frame was banned and i’ve got these lovely crutches and today i must tackle the stairs. I was terrified, but actually it wasn’t that big a deal although i expected to do the fake stairs ( where there is about 3 up then 3 down) But no i had to do a real flight of stairs, and come back down. It wasn’t as hard as i’d made it in my head. I spent the day mainly bored, as most went home in the morning yet in the afternoon i was still there. I had to have an x-ray to check everything was alright before i could go, and the drugs needed sorting. I eventually escaped at tea time, and i had the BEST welcome home ever. The car journey was vile and sore (god only knows how Kate did a train) But the smiles and huggles off the girls made it all melt away. I finally got my appetite back once i was home (in fact i can’t stop being hungry!) and i slept sooooooo much better too once in my own bed, with my baby by my side. Boy had i missed having Rich with me!! Saturday and Sunday. I finally got to see my girls on the Saturday as i’d wanted all tubes and ill looking stuff removed first, as this would of freaked them out and upset them. The crew wake you up around 6-7am which is so early to me, and this time it’s up too me to wash myself and sort myself out, whereas the nurses had been doing it previously. Saturday was the first time i ever got out of bed, and it was a shame it was the same day the kids came up. I felt sick and so shaky and i was given a frame, the famous zimmer. My legs had no signals going to them no matter how hard my brain was shouting instructions to them. But i had to push through it, as nurses say your mobile now so you can take yourself to the loo now, no need for us! I thought that was well harsh, would of liked some support for the first few trips, just to make sure i didn’t fall. I would never of guessed how tiring it was, just going to the loo and back, so i slept like a log once family had gone. Sunday was a blur of lots of trips to the loo by myself and gaining confidence, so equally i spent a lot of the day flat out asleep too, to recover from each little adventure from my bed. The frame certainly helped me feel steady and safe, but it is a slow mode of transport, so make sure you have time to actually get to the loo and don’t get caught short! I’m still not dressing my lower half by myself no matter how hard i try. The girl opposite me is rocking it, and i was well jealous! Just the dignity to put your own knickers on would of been nice. But i understand it will come eventually. Noticed my leg like to do it’s own thing a lot, so i recommend getting someone to wedge a towel along your ankle to make your foot face fowards, as mine would rest flat going west, pulling the groin area. It hurts a little at first to have the towel there, but it is needed so keep a good position on the leg. The first night on HDU went well ish, i could feel pain but it was nagging and dull. The worse thing was not being heard by the nurses as someone else had needed all hands on deck, so got overlooked at bit. But i totally understand, and do not disagree with the nurses in anyway. Just managed sandwiches on the tea time, but had plenty of fluids which felt good. 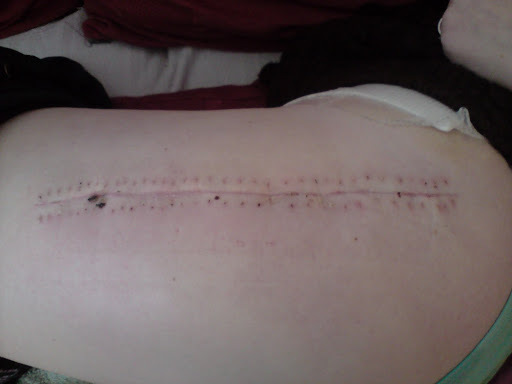 The next day the epidural was being turned down, and everytime they did it it would totally numb the right leg but not the operated leg, it was a disaster pain wise, and only got worse and worse as the day and night progressed. They decided the fentanyl (sp) side of the epidural didn’t work anymore and needed stoppping. I was scared at first but then if it’s not working then i’ve nthing to lose really. They then tried me on Tramadol and Codeine and Oramorph with the later every hour but still this did not work. I was feeling like my leg had been pulled off at the hip, and so powerless to do anything. What was worse was a (lovely lady) said ‘well it is going to hurt isn’t it!’ Well if i could of punched her i would of, and i’m not a violent person. The night was long and i wished a few times that i could die (sounds so dramatic, but i’m being truthful, this is how i felt) But a very very nice nurse who tended to be nearly every hour on the hour all night promised it would never be as bad as it was then ever again, and she was right. She definitely my Florence nightingale! The following morning i had got some pain relief, and was very thankful. But the pain management team decided i would do better on the Oxycontin which were 12 hour release tablets. Which i have to say were heaven and totally got on top of the pain for me, and i would have the oral morphine as and when needed rather than every hour! As i’d had no sleep from all that pain the night before, once i’d been given the Oxycontin i found relief so i slept as much as possible all day to catch up, i would wake up solely for food and maybe a visitor or two, but as soon as i could sleep i would do. I started some physio but will being so weak and only just got relief, they decided my physio could just be done on the bed today, rather than get me out to walk with the zimmer. The exercises wore me out proper, and i had no control over the leg at all yet, so couldn’t of got out of bed even if i wanted too. I could barely pull my toes towards myself, let alone bend my knee and lift my ankle off the bed.